Ampthill RFC confirmed a third place finish in National One with one game to go after a 35-12 win over Cambridge at Dillingham Park on Saturday. Sam Baker touched down in the first and last minute for the A’s in a game that required the home side to defend stoically for significant periods of the game. The 5-2 try scoreline was testimony to Ampthill’s clinical finishing and better use of possession. Former Tongan internationals Maama Molitika and Aleki Lutui crossed the whitewash to hand Ampthill a 21-7 lead at the turnaround, bolstered by Stef Jones’ 100 per cent success rate with the boot all afternoon. 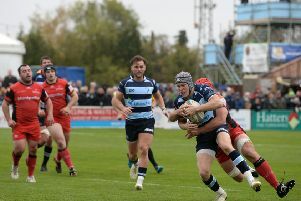 Four minutes after the restart, A’s Pete Weighman added the all-important bonus-point try that clinched third place in the division. The visitors responded with a second try of their own 10 minutes before the end, prior to Baker’s second of the afternoon at the game’s death. Speaking about his side’s victory and league position, Ampthill’s director of rugby Mark Lavery said: “We’ll take it. We came out the blocks quickly, hit them hard, then went back into the changing room for 20 minutes. “We made life difficult for ourselves, showed a lot of character in the second-half and, ultimately, got what we deserved with the bonus-point win. “If you’d asked me at the start of the season if I’d take a third-place finish in National One, of course I would. “We’ll now spend some time reflecting and then get ready for Rosslyn Park this weekend (Saturday). “It’s a bit of a dead rubber of a game, but that’s not we stand for.